Hello minna! Have you ever wondered about certain mysterious events or possible plotholes in One Piece? I know i have. So, today’s post is especially dedicated to the top mysteries in One Piece. Ready to get mind blown? Then read on! Remember Makino? She was the woman bartender from the Partys Bar, back in Luffy‘s home town, Foosha village. Makino was very fond of Luffy, and close to Ace as well. She was also a close friend of Shanks, since he and his pirate crew visited the bar there. 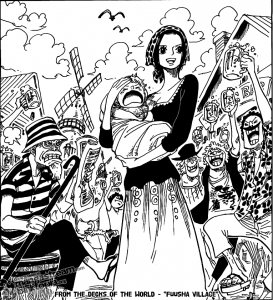 What’s interesting about her is that after the timeskip she was shown carrying a young son in her arms. What if that boy is the son of Shanks, or maybe the son of another red haired crew member? In the Zou arc, we saw an interesting happening. 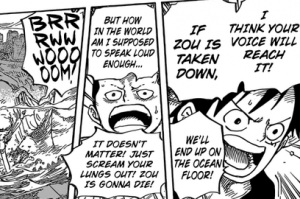 Luffy could hear the giant elephant Zunisha speaking, as well as Momonosuke. I believe that this has something to do with the ability to hear the voice of all things, as we have discussed in another theory. However, Momonosuke could also speak to Zunisha and order her to attack and wipe out Jack’s fleet. Why? Well, there is a possibility that Momonosuke has a power similar to Shirahoshi and be able to order Kings of Beasts. That could potentially mean that he also is an Ancient Weapon. Or, that he simply has a better ability to hear the voice of all things than Luffy. Alternatively, Zunisha may be obligated to answer and follow orders from members of the Kozuki clan, and who is more fitting for that than its rightful leader, Momonosuke? In the cover of One Piece chapter 631, Crocus with Laboon were having a mysterious visitor. A visitor who they were really happy to see. Many have speculated that this visitor was a former crew mate of Crocus, another member of Roger‘s crew. When Scopper Gaban was made known as a member of Roger’s crew, he was immediately thought to be the mysterious visitor. However, in the colored version of the cover, the mysterious man was shown having blonde hair, when Scopper Gaban has dark hair. So, who could the visitor be? Maybe Shiki judging from the color of his hair? Highly unlikely since he was a rival of Roger. What about Nekomamushi? We also have to note that the visitor had a hat similar to the Wano Kingdom ones. So, was he Kozuki Oden himself? 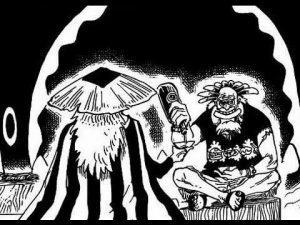 Or another person we’ll see in the Wano arc? It remains to be seen. We have written a quite comprehensive theory on this one, so be sure to check it out if you haven’t. To add to the ideas there, i will just mention another interesting theory. Could it be that a giant tree has its roots in Fishman Island and goes up to the holy town of Mariejois? It may be the tree that originally produced the devil fruits. For more interesting ideas on this one, check the post above. #2. 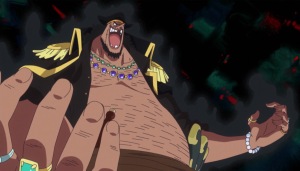 Why can Blackbeard eat two devil fruits? We do have a post on this one as well, so check it out. We also talk about We do have a post on this one as well, so check it out. We also talk about the way the Blackbeards steal devil fruits, so interesting stuff there. Lets add some more ideas to the discussion here as well. Marco referred to Blackbeard’s body as being “atypical”. We have some ideas on this one in our theory, so lets add a new one here. Ace, when he confronted Teach, stated that he has lived twice the life Ace has. However, many have said that the translation wasn’t right and Ace was reffering to a double life. What if Teach absorbed Thatch when he killed him, thus obtaining the ability to have a second person living inside of him. That way the second fruit belongs to the dead body of Thatch and Blackbeard is just using it. One of the top mysteries in One Piece remains the location of Raftel. What amazes me still, is the fact that none of the Yonkou has been able to reach it. One part of the puzzle was demystified when we learned about the four road. Those four poneglyphs point to four islands. The point where the four lines of the islands converge, is supposed to be the place where Raftel resides. One of the poneglyphs is currently at Zou, the other one is in the posession of Kaidou and the third one in the hands of Big Mom, Charlotte Linlin. The location of the fourth road poneglyph is currently unknown. But what is at the island of Raftel? What is the treasure that Gol D Roger has left there? You can read ideas about this one in our theory above. I don’t really believe riches was the treasure of the Pirate King. Most probably, the treasure is the truth of the Void Century. A truth that when learned by everyone will lead to people being able to live together harmoniously once and for all, making the One Piece a reality. So, there are so many mysteries still in One Piece waiting to be answered. Raftel, the Void Century, the true nature of Ao Kiji, the secret of Blackbeard, the role of Momonosuke, Makino and her son, Luffy’s mom, the National Treasure of Mariejois and Crocus’ visitor are the mysteries we just barely touched. Hope we did shed some light today on these One Piece mysteries. Question of the day–>> Which is your favorite undebunked One Piece mystery? Let me know in the comment section below! Previous: FRANKY, HOW POWERFUL HE HAVE AFTER THE TIMESKIP? Next: Trafalgar Law Crew – Where are they?